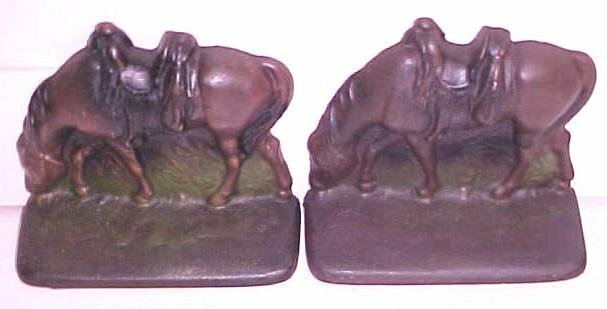 Offering this pair of vintage solid cast iron bookends of a saddled horse grazing, very nicely detailed. 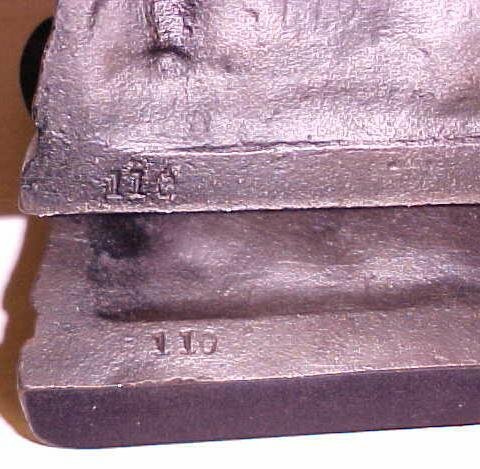 Each measures 5.25 inches wide x 4.6 inches tall, no makers marks, but we do note a model number "110" on each. Each one is nicely painted, the horse and saddle are the best condition, with some of the green grass paint worn off on one more than the other, but both still look pretty good, very clean, no rust or pitting. One of the nicest painted sets we have seen like this! No dents or cracks. Each one has a felt covering on the bottom shelf contact surface. A great pair of bookends for holding your vintage western books! Items Similar To "Horse Bookends Cast Iron Antique Pair"